Depression in young people, be they young adults or even kids, is a topic that is so rarely brought up in conversation and so desperately needs to be addressed more when talking about depression in general. Anyone at any age can have negative thoughts and lack of confidence to go forward and improve oneself, not just adults, and the sooner people realise what an effect it can have on young people the earlier we can help anyone suffering from it before they decide to take more drastic measures. We absolutely feel that it is a cause worth fighting for, and that anyone who has depression must be aware that, like the common cold, it can strike anyone of any age at any time; it’s not just limited to adults. 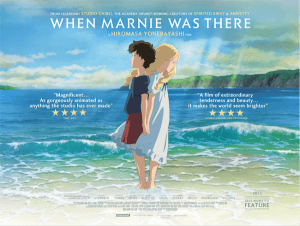 We bring this up because it is one of the many topics addressed in When Marnie Was There, the latest film by Studio Ghibli and currently its last after the Japanese anime powerhouse announced a hiatus in the wake of co-founder Hayao Miyazaki’s retirement. Should this be the last film it ever produces, as some fear might be the case, then it will be a powerful and emotional one to go out on. Adapted from English author Joan G. Robinson’s novel, moving the action from Norfolk to Japan, Anna (Hailee Steinfeld in the English dub) is an isolated and unhappy young girl living with foster parents in the city. When an asthma attack causes her foster mother (Geena Davis) to send her to the countryside to live with relatives (John C. Reilly and Grey Griffin), she still finds herself unable to fit in and make friends. However, she soon comes across a dilapidated mansion overlooking a salt marsh, which she later dreams of while seeing a blonde girl in one of the rooms – she later comes into contact with that girl, who goes by the name of Marnie (Kiernan Shipka), and they quickly form a special friendship, despite the mysterious circumstances surrounding Marnie and the mansion, which episodically looks in good repair and even occupied with guests and residents. The crux of the story, at least in our opinion, lies within the personal struggle of its lead character – like many Studio Ghibli films, it features a young protagonist who is confronted with a moral and personal dilemma that many people, not just children, will recognise instantly but is swiftly adapted to fit within its more fantastical elements. It’s clear the moment we first meet Anna that, aside from her asthma, she is suffering from some kind of depression that is clouding her better judgement, lacking in self-confidence and alienating most if not all potential friends around her as a result of her insecurity. We learn later that this stems from a discovery she made in connection to her foster parents, which also introduces the notion of what foster children must feel like to be in that situation with non-relatives posing as legal guardians, but it’s hard not to recognise a state of depression within her body language and anti-social behaviour, something that a mixture of the writers, the voice actress, and the animators work heartbreakingly well together on to convey on-screen. Anna and the very personal struggle she is going through is respectively a character and a concept that is not explored as often in children’s films, or even films in general, and because the character is written so effectively and the subject of depression is handled so delicately it makes for a far more emotional experience than it already is, which is something that Studio Ghibli can proudly name as one of their greatest achievements as of late. As we can expect from the studio that brought us classics like Spirited Away, My Neighbour Totoro, Howl’s Moving Castle, Princess Mononoke and many more, When Marnie Was There is a masterclass of atmosphere, story and, of course, absolutely stellar hand-drawn animation. The countryside landscapes are extremely luscious to look at, to a point where all you want to do is frolic and sunbathe within the green fields and riverbanks amidst a glorious sunny or moonlit backdrop (sometimes rain as well, which still looks unbelievable despite the gloominess), with all of it helping to establish a fair and light-hearted mood that makes the tougher moments slightly easier to swallow. We also find ourselves wanting to know a whole lot more about these warm and likable characters, with Marnie’s mysterious past being something you want to discover even if it does lead to a very sad payoff; a sign of a good movie with strong characters is that you want to spend more time with them even when the film wraps up, and this one is no exception. We will say, however, that if anyone is expecting something along the lines of, say, Spirited Away in terms of fantasy and mythical creatures, they’ll likely to be oh-so-gently disappointed because this really isn’t that kind of film; it’s more of a film about childhood, friendship, and the hardships that come with both. If When Marnie Was There does end up being the last Studio Ghibli film, it’s one hell of an emotional note to go out on. When Marnie Was There may lack the fantastical worlds of several past films by Studio Ghibli, but it still has wonderful atmosphere, heavy themes, complex and likable characters, and some beautiful hand-drawn animation that makes it a wonderful film for anyone of all ages to watch.